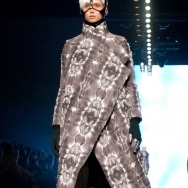 The fashion brand of the Amsterdam Fashion Institute apparently heard of our mission to go to a Brave New World. Their new line can best be described as Neo from the Matrix, who manipulated the DNA of a seahorse, and rode it all the way to a Brave New World. With a wig on. 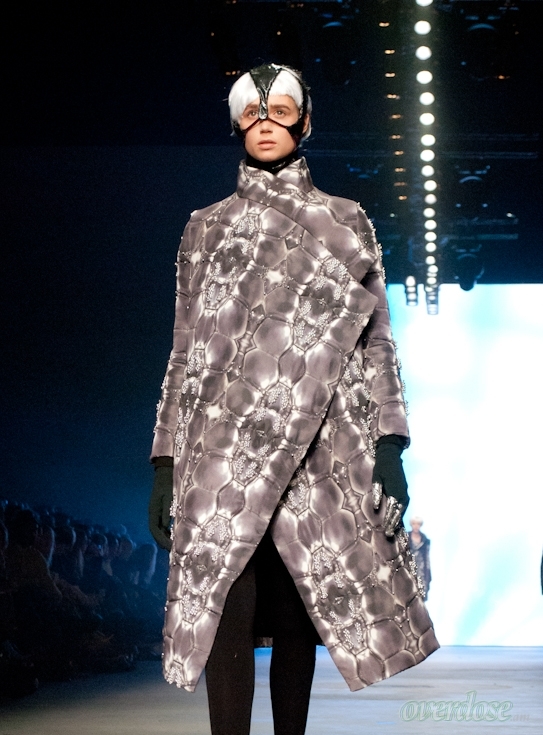 A lot of shiny leather, layers and ‘Fifty Shades of Grey’ accessories around the models’ heads were the main focus of this show. They say that when people are in a recession, they long for the good ol’ days. But Individuals doesn’t seem to agree, as this line was very futuristic. 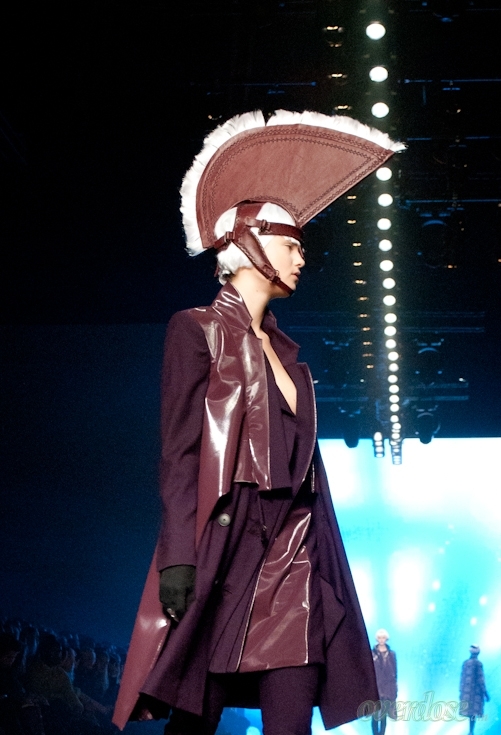 The 24 students who worked on the brand this season wanted to show clothing as armour. 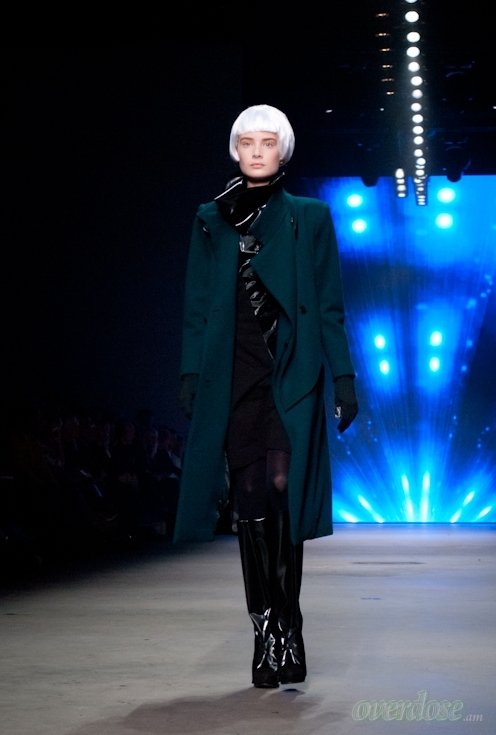 The collection was called ‘ELEMENT A/W 13-14’ and the team called themselves ‘Generation 14’. (It doesn’t get any more X-files than that). They played with different kind of fabrics, and put colours like burgundy, army green and dark turquoise hues next to black, put see-through fabric against sturdier materials and shiny against matte, to show how us mere mortals would look if we were soldiers from the future. The make-up was natural and the models all wore a white wig. Now I do love a bit of leather, but they took it a bit too far for my taste. I think it might’ve been the snake-like ‘necklaces’ that put me off. But I guess you have to see the pieces separately as well. And I can see myself wearing that long trenchcoat (which I fell in love with from moment one) with a see-through top and leather pants for sure. Scotty, beam me up!